The summer holydays are in its middle and I’ve got a plenty of uneddited photos from vaccation waiting inside my computer and the dust is slowly and softly falling over them. It’s a lazy and busy time and I can’t find enough free moments to edit those photos. 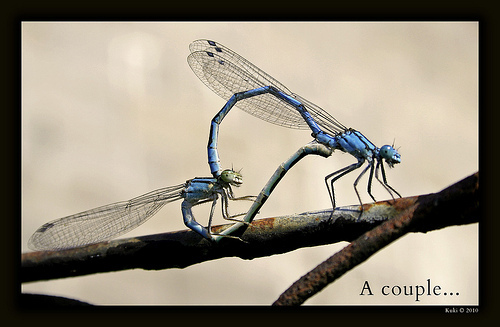 At least I had a while today so I prepared this lovely couple of dragon-flies. First of all, I noticed them when I was walking with my cam around a garden. They were in a position so they looked like a heart. I took several shots, but the best one was this and as you may see, they had changed their position a little and they don’t look like a heart anymore… Pitty, it could have been a nice metaphore for love.